Not sure but how did you shoot? We ought to use this thread for everyone to post their score and classification. Indoors: 762 3x! UGH....at least my marksman card is still valid. If I shoot decent in a future match, I have a shot to be high marksman. HERE is where they will be once complied. That also goes out in the mail to competitors I think in April. This inspired me to look back at my previous indoor sectionals. 2012 will not be so pretty, still having issues with my shooting hand. Think I shot around an 849 24x. Keep missing that master class by just a bit! And I do not mean to make an 849 seem like a poor score, it is not. Just not the improvement that I had hoped for over the past 12 months. But considering the injuries and other outside issues I am pleased to have not gotten worse! I tied Brian Mallette for 25th overall. 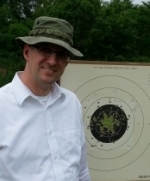 867-25x Felt pretty good and had to shoot at a range in IL because of traveling with my job during the OH sectional.